We arrived at our hotel in Florida after midnight, when all the nocturnal animals are out. 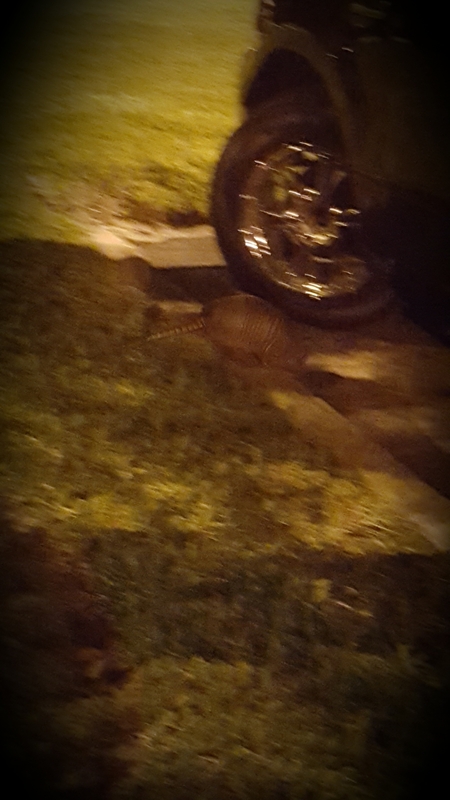 Apparently armadillos live in Florida, so we got to see a wild one in the parking lot as we walked from the car to the hotel. Darkness + No Flash = Potato Quality Photo. Didn’t use flash so the little guy wouldn’t get scared. The armadillo wasn’t the only little critter we encountered on our Florida trip. 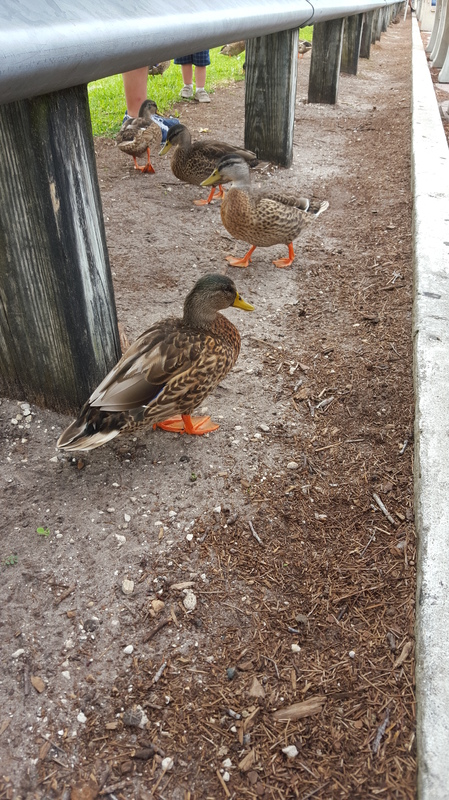 Squirrels and ducks were everywhere around the parks, begging for food and often receiving it. 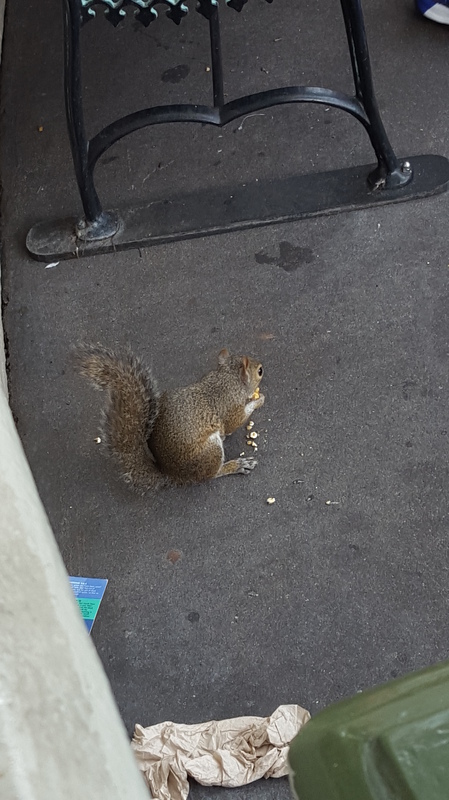 The squirrel was frightening people by running at them to make them drop their food. Smartest little dude ever. There were a few heron-like birds (later learned they’re called ibis) begging everywhere as well. Begging seems to be the best way for an animal to feed itself in Disney World. I’m all out of good captions. There were songbirds flying around as well. One in particular would land on our hotel balcony after we were done eating breakfast out there and eat up all our crumbs. There was another songbird that attacked the window of a restaurant we ate at. According to the waitress, the bird attacks its reflection during mating season to show off for its mate. Unfortunately, the little songbirds were too fast to take pictures. I did manage to snap some photos of some quick little lizards that liked to sun themselves on the sidewalks around town. 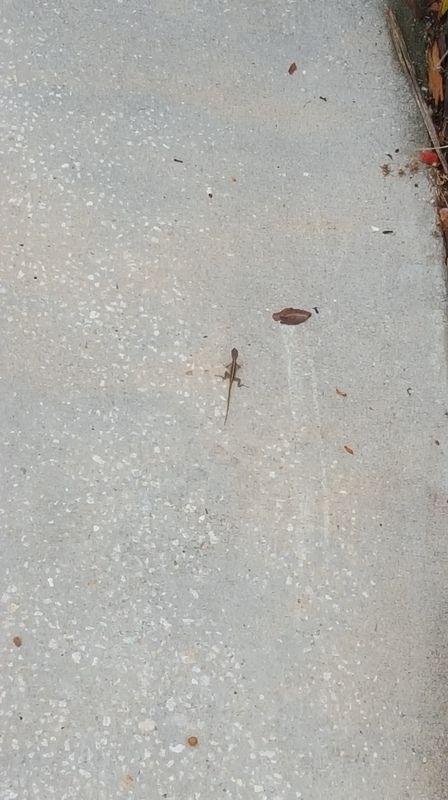 The lizards camouflaged themselves against the sidewalk and skittered away when we got close to stepping on them. There were also fish in the many lakes that dot the Disney World Resort, but too many people were crowded around the fish to get a good shot. 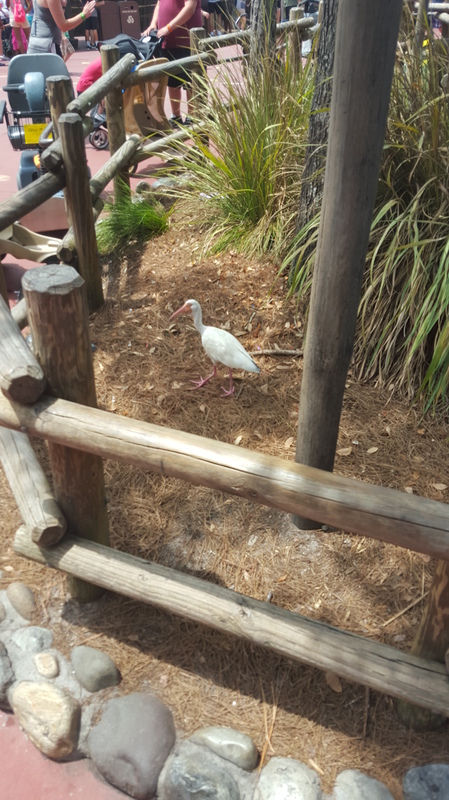 So not only is Disney World full of tourists, its also full of animals for the tourists to take pictures of! Last week my wife and I went to Disney World in Orlando, Florida. The plane we were scheduled to be on had a mechanical problem so it couldn’t fly. While waiting in line to get out onto another flight we heard all sorts of people complaining. While I didn’t want to be rude and tell them off there, I can do that on my blog. Perhaps you missed the announcement where they answered this question, we’re waiting in the lobby because another plane is going to be using the gate we were at in a few minutes. If they spent the whole time up there giving us tickets instead of checking tickets for the next flight, the next two flights would never leave either. I needed to come down to claim my bag to get it onto the new flight anyways. Plus, there are four attendants in the lobby, so you’ll get served faster than if we waited for the two upstairs at the gate. Going through security again isn’t fun for anyone, but this is the fastest solution. Personally, I prefer the system where the plane is checked before every flight to see if it’s good to go instead of only once a week… Otherwise a plane could be flying for as long as six days with something wrong with it. Would you want to be on that plane? Anyways, we ended up on a different airline with a connection to Orlando in Salt Lake City instead of Dallas. We also ended up with a seat upgrade which was nice. Leg room and free movies to watch. Maybe not worth the five hour delay, but so nice! After landing in Orlando we did the usual thing of grabbing our bags and the rental car before heading to the hotel.